Thank you so much for another fantastic post. 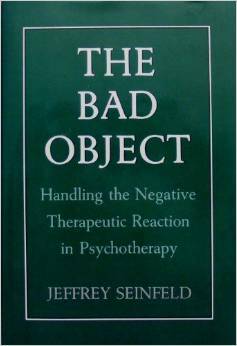 This part had a particular impact, as this is exactly what I’m doing in my therapy, but had never thought about it in quite this way: “the patient activates the all-bad self-object unit to defend against internalization of the positive self and object unit. The insatiable need serves the antidependent defense. By making her need for contact with the external object insatiable, the patient can perceive of herself as rejected regardless of the external object’s behavior. Therefore, the patient is always able to think of her needs as being unmet, to think of herself as rejected and of the object as rejecting. The activation of the all-bad self and object unit results in depression and rage.” How does one fight what feels like the perfectly logical and _necessary_ nature of that insatiability? As always, your writing is incredibly thought-provoking….. I really like your blog and keep it in mind every time I´m struggling with doubt that I will ever be free from the pain. It´s a big source of hope to me and keeps me hanging on to this hellish process. I´m thinking of e-mailing you once I´ve collected my thoughts enough to put them into words. I´ve been seeing a psychodynamically trained psychotherapist once a week for about five years now. I don´t know where I am on the road to recovery (in lack of a better word) but my therapist is encouraging me to get in touch with and grieve the abandonment wound. It got triggered pretty massively when my ex broke off with me and I´ve been trying to deal with it for about a year now. Going thru this hell I was wondering if you ever did any grieving? If not, how do you think your fear of abandonment healed? I´ve been trying to find as much information about this psychological cut as I can (I have to say that it´s a shame that it hasn´t been more research done on it, since there are a lot of people suffering from it, not just people diagnozed with BPD), and what seems to be the common idea is that it cannot be healed through a correctinve experience but needs to be felt all the way and by that healed. Hi Lucy, Thanks for your nice message. Yes, feel free to email if you want and we can discuss anything you want. My general ideas about a loss of an important relationships or parent substitute is that like you said it has to be mourned, and also, it’s helpful to build up a network of a few trusted friendships to mitigate the loss and allow one to feel supported enough to work through difficult feelings around losing someone. This provides brilliant insight. I can relate how the bad self other objects become the sole focus of one’s attention in borderline conditions. When we encounter those who do not fit the mould of disappointing objects that we encountered when young, its likely we will reject them by projecting our past experience onto them. It can take so long to realise it is something we are setting up with our own thoughts and fears. Thank you. Yes, this is how the object-relations/Kleinian model understands borderline states. It is not that hard to understand when one considers how important our early relationships, good or bad, are for us as children and young adults, and how strongly we can remember their effect even later in life. It takes a lot of work to shift these patterns and to see reality through new “eyes”, new object-relations eyes so to speak.